Is This The World's Oldest Aboriginal Rock Art? Another stunning break-through about how long Aboriginal people have been in Australia was confirmed recently by researchers studying a cave on Barrow Island, north-west WA. It's a discovery that's pushed back man's first arrival to Australia at least 50,000 years 'Before Present' (BP). As well, the cave has given researchers compelling evidence about what people from that ancient era ate—from way back then up until about 7000BP. Australian scientists, with the assistance of traditional owners in northern WA, are on the verge of reshaping how the world understands Aboriginal cultural history. 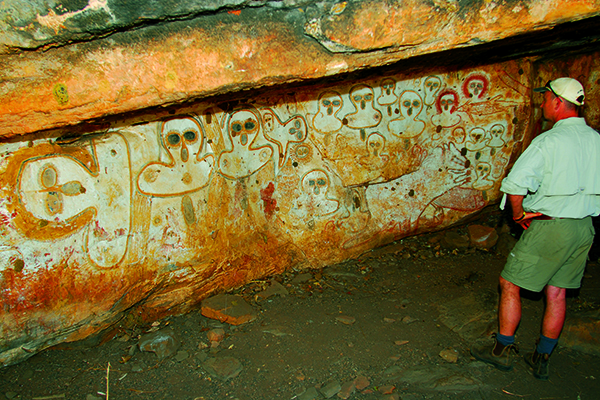 For many years, the rock art of the Kimberley and northern Australia has been thought by some to be the oldest in the world. However, dating techniques—up until recently—had the art at 17,500 years or so BP. That's significantly younger than the oldest art so far discovered at El Castillo in Spain (41,000 BP), while the famous horses and cave lions of the Chauvet Cave in France are pegged at 37,000-years-old. In 2014, a discovery of rock art in a network of caves in Sulawesi, Indonesia, suggested a date of nearly 40,000-years old, shifting the focus from Europe to this part of the world. In the Kimberley, the two most distinctive forms of art are the acclaimed Wandjina figures and the much more lively and graceful Bradshaw paintings—now officially known as 'Gwion Gwion'. The late Graeme Walsh, who was a leading researcher on the Bradshaws, and who has done more than most to bring them to the attention of the world through his incredible work and subsequent (and expensive) books, was convinced the art was at least 35,000 years old. Now many researchers believe mankind reached Australia about 60,000 years ago. 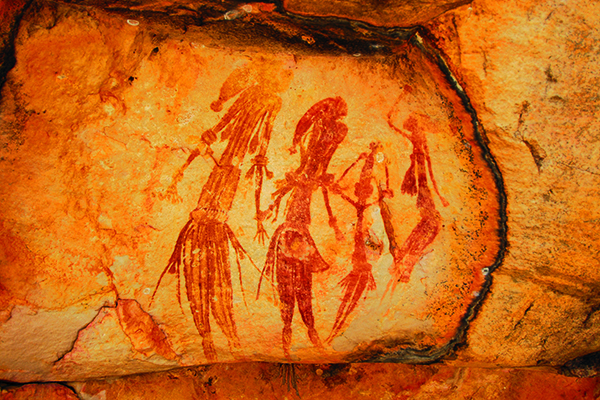 This latest research suggests the art in the Kimberley is from the same ancient era. The Kimberley Foundation Australia (KFA) is the driving force behind the recent study of art in the region, and the Dating Project has been set up to answer the question: How old is the art in the area and does it date back to the very earliest settlement of the country? Initial results are pretty exciting and if the art is as old as it now seems to be, it would also mean that the rock art of the Kimberley is the oldest, continuous painted record anywhere on earth, which is pretty bloody amazing! What is equally amazing to me is how accessible some of these sites are to wandering travellers in the Kimberley. It's a great privilege to be able to see them. For many four-wheelers travelling in this region of Australia, the ancient rock art is a major attraction and even if it is not, it is always something that piques the imagination. For many people the Wandjina heads near the King Edward River crossing—on the way into the magnificent Mitchell Falls—is people's first and often their most significant viewing of this incredible art form, while nearby with a bit of searching, some impressive Bradshaws can be found. Still, whatever the results of the latest research, the bodies of rock art across the top of Australia are some of the finest in the world and we are extremely fortunate that we can easily visit these places and admire the work of those ancient artists.